This recipe evolved from a Cook’s Illustrated recipe. It has been made simpler and less fufi. It’s all about making bread in the real world. Although it takes many hours until you get bread, once you’ve done it the total actual hands-on time is about 20 minutes. A starter, or Biga, is made in advance of the dough. 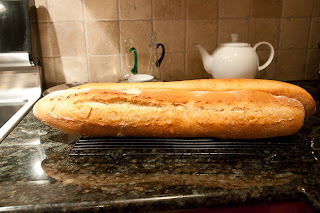 The recipe makes two long loaves or one very large loaf. To make scooping/scraping dough out or cleaning up easier, make a scraper out of the lids (cut in half) of large plastic yogurt or sour cream containers. Time from start of main dough to finish, including work times, is just over 4 hours, then about 30 minutes to cool. Combine flour, yeast, and water in bowl of standing mixer fitted with dough hook. Knead on lowest 1 to 2 speed until it forms a shaggy dough, usually 2 to 3 minutes. Transfer biga to medium bowl, cover tightly with plastic wrap, and let stand at room temperature until beginning to bubble and rise, about 3 to 4 hours. Refrigerate biga at least 8 hours or up to 24 hours. If making bread in one day, make biga by mid-morning and use for bread in the late afternoon – the flavor is acceptable, but not quite as good as biga that ferments for 20 hours. 1. Remove the biga from refrigerator and it let stand at room temperature while making dough. 2. Add the yeast to the water, stir, and let it dissolve while measuring out the flour. 3. Combine flour, yeast, and water in bowl of the standing mixer fitted with dough hook. Knead the dough on low 1 to 2 speed until rough dough is formed, about 2 to 3 minutes. 4. Turn the mixer off and remove the dough hook into the mixer bowl, cover the bowl with a plate or loosely with plastic wrap. Let the dough ‘rest’ for 20 minutes. 5. Uncover and reattach the dough hook to the mixer and add the biga and salt to bowl. Continue to knead on the lowest speed until ingredients are incorporated (dough should clear the sides of the bowl but should stick to the very bottom), about 2 minutes. Add a small amount of flour during kneading so that the dough is not too wet. I like it so it does not stick to the bottom of the mixing bowl in speed 2. Experiment. 6. Increase the mixer speed to low (speed 2 on a KitchenAid) and continue until the dough forms a more cohesive ball, about 2 to 3 minutes. 7. Transfer the dough to a large bowl (at least 3 times the size of the dough) and cover it with a plate or plastic wrap. Let the dough rise about 50 minutes at warm room temperature and 10 to 15 minutes longer if much cooler. 8. Remove the cover and turn the dough following illustrations below on Turning the Dough. Replace the cover and let the dough rise another 50 minutes. 9. Dust the work surface liberally with flour. Hold the bowl with the dough at an angle and gently scrape the dough out of the bowl and onto the work surface. 10. If you want two smaller loaves, cut the dough into two equal halves. 11. Dust the dough and your hands liberally with flour and, using minimal pressure, push dough into a rough 12 to 14-inch square. If you are making two loaves, shape each piece into a smaller rectangle. Shape the dough following the illustrations below on Shaping the Loaf. Pinch the seam to seal it. 12. Transfer the one-large loaf to a large pan (seam down) that has been wiped with a small bit of olive oil to keep from sticking after baking. Dust loaf liberally with flour and cover loosely with plastic wrap or a light dish towel. For two loaves use a large flat pan or a large perforated bread pan. Let loaf/loaves rise until doubled in size, about 1 hour. 13. Meanwhile, adjust the oven rack to the middle position and pre-heat the oven to 475 degrees so that it gets to temperature by the end of last 1 hour rising. 14. Get ready some flour in a small sieve for dusting, a pair of scissors, and a spray bottle of water. 15. Cut a slit at least a half inch deep across the top of the loaf (from about 2 inches in from the ends), taking care to be smooth and not collapse the dough. Dust the cut liberally with flour, and then lightly spray the top of the loaf with water, with the flour in the cut being more thoroughly soaked. The wetness keeps the dough elastic during the big oven rise and you get a bigger and fluffier loaf of bread. 16. Bake at 475 for about 10 minutes, then lower to about 420 to 425 for 22 to 24 minutes for one large loaf and 20 to 22 minutes for two loaves. Baking time may vary and the loaf should be well browned when done. Ovens differ greatly and my piece of junk likes to stay overly hot, sometimes at 450, but the loaves still come out great. 17. Cool on a wire rack for about 30 minutes. Listen to the popping and crackling of the thick crust as it cools – a mouth watering sound. Slide plastic bench scraper under one side of dough; gently lift and fold one third of dough toward center. Repeat step 1 with opposite side of dough. Finally, fold dough in half, perpendicular to first folds. Dough shape should be a rough square. After delicately pushing dough into 12-14-inch square, fold top left corner diagonally to middle. Begin to gently roll dough from top to bottom. On the pan, gently shape dough into 16-inch football shape by tucking bottom edges underneath.